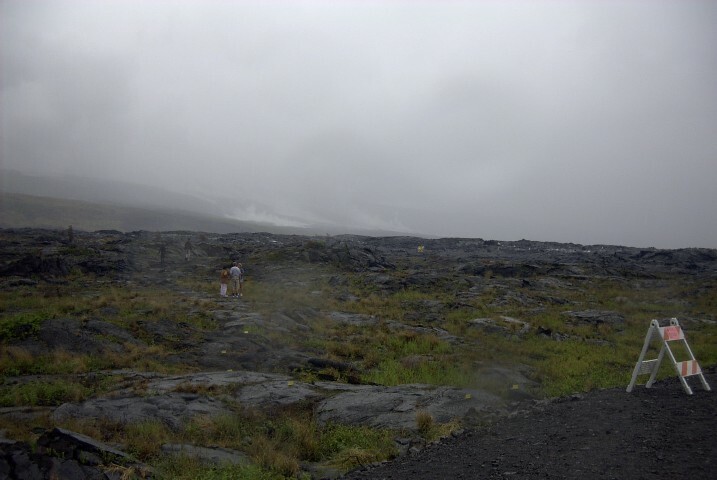 This blog began as a way for me to document my life on an acre of lava. In a way, I was partly joking about it. What in the world could I grow on an acre of nothing but lava rocks? My friends know that I have lived on good California, Mississippi, Rhode Island, Alaska, Arizona, Illinois soils, where I could grow almost anything , given the local climate. Neither my knowledge nor experience were much good here, but I love living in Hawai`i too much to leave, so I had to learn how to make the best of it. 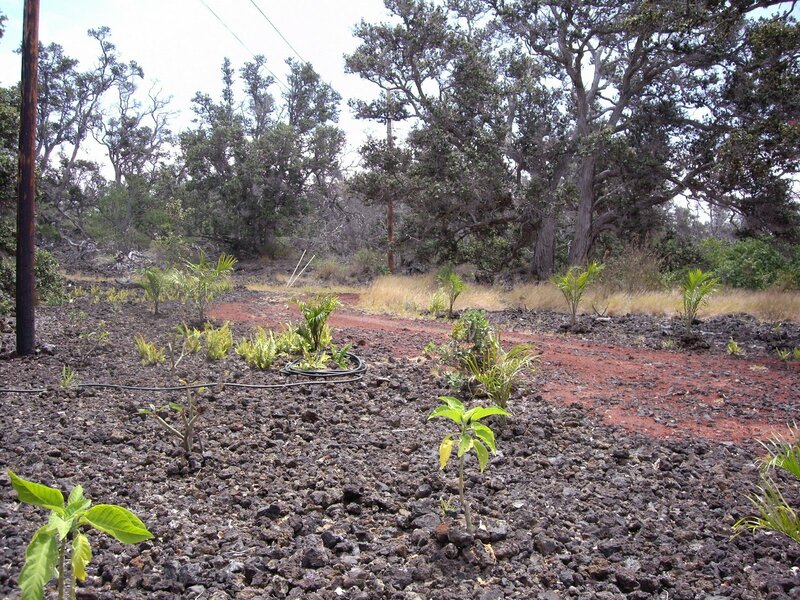 Several times in the past, in addition to the resistant lava, I have mentioned “vog.” In this post, I will describe the two types of lava we have here and also talk about the vog that destroys plants and lungs. There will be quite a few links in this article, so please go check them out. They say much more than I can. The picture above is one of my early experiences with lava. At the time, I had a 2004 Miata, hot red as you can see. Since then, I have gotten rid of it and now use a older Mazda Tribute that can haul a little more lumber than the Miata! One day I was backing up to unload some bags of soil from our local Ace Hardware. I misjudged where the path turned and ended up sitting on top of this lava heap. A good friend and neighbor came with his SUV and a sturdy tow rope to pull me off. That was the day I began to think about getting rid of the Miata! 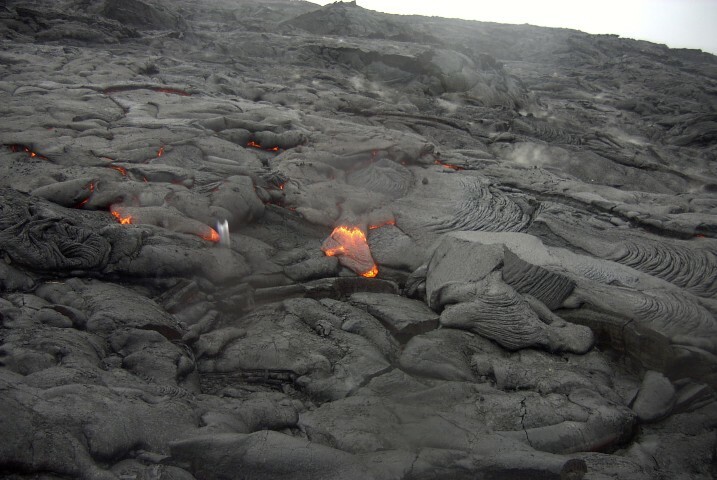 That picture also shows one of the two types of lava, what the Hawai`ians call a’a. You pronounce it like ah-ah, with a quick pause at the hyphen. It is primarily rocks of various sizes. It will wear out the fingers of garden gloves very quickly. My fingers have toughened up a little bit, but it can still cut. Last week I talked about the progress of my patio. Here’s another shot of that spot before we started work on it, and it gives another good idea of the a’a lava. This picture of one of my coffee trees shows how I need to plant anything. I dig a hole, pour in lots of soil, either bagged from Ace or made at home with pig dirt and manure my lovely chickens provide for me. Then I pile rocks around it to help keep the soil contained. It still filters down through the rocks underneath. Here is a view up the driveway from my house. 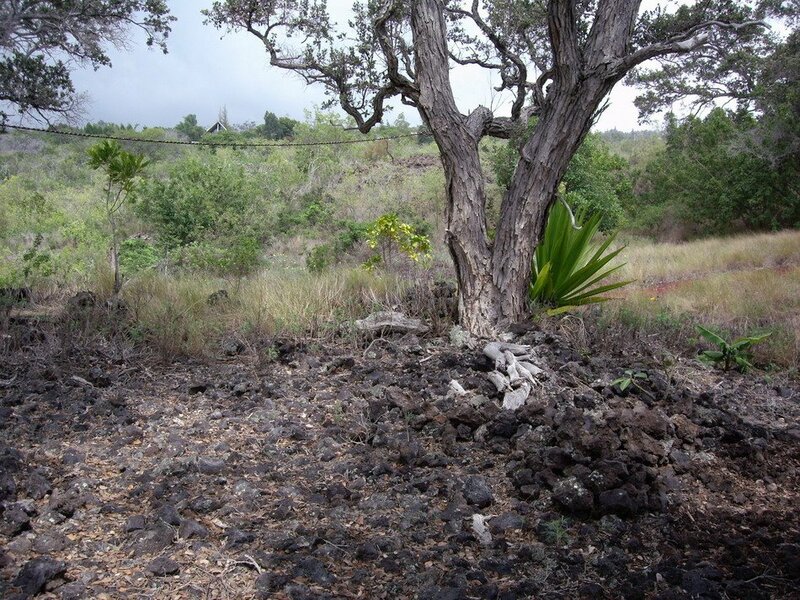 You can see the spread of lava in what I jokingly call “my front yard.” I’ve put triangle palms along each side of the drive, and there are a few other scattered plants. I have four more ready to plant. 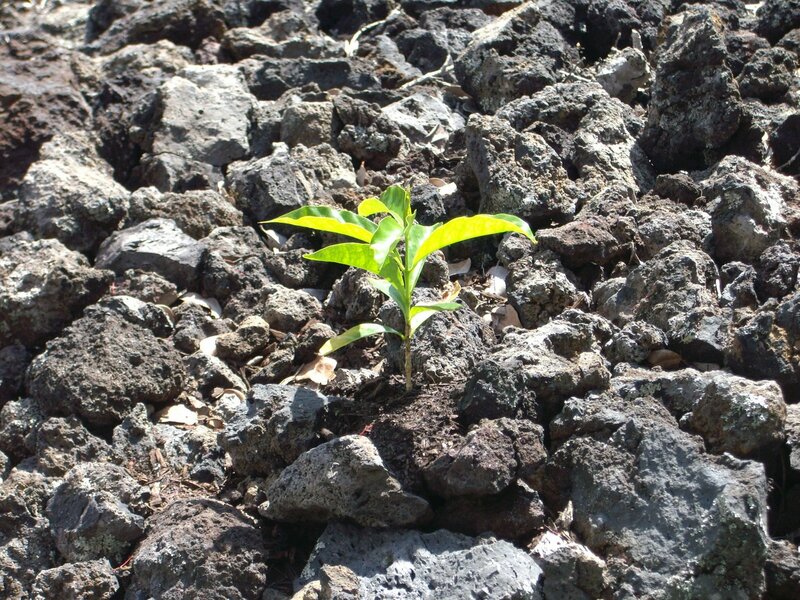 Since a’a is the only kind of volcanic rock I have in my yard, I am including pictures I took on a hike over the volcano at Hawai`i Volcanoes National Park. 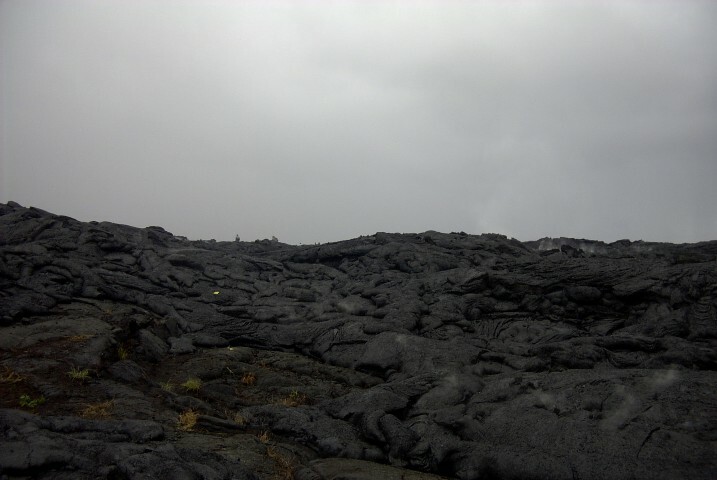 These shots will show you the other type of lava, pahoehoe, roughly pronounced as pah-hoy-hoy. It is the Hawai`ian term for basaltic lava and it looks like big swirls of melted black chocolate. Yum! Here you can see the path we took with the volcano in the distance. People were always on the path to get in to watch the live volcano flow. There are warning signs all over about what kind of shoes to wear (and not wear), the sort of protective clothing, and the like. A flashlight is always recommended in case you are hiking at night, or if you get lost and end up there at night unintentionally. There are barricades along the sides of the path, but they end after a certain distance and you need to rely on your eyes to know where to go. If you plan to go, please read this link. Here’s another view along our hike. You can see how easily you could lose your way, once the barricades end. At last, we see a live lava flow! This is where you need to use caution. We seem to lose people every year who get too close to take pictures, and the “bench” breaks off beneath them. Not exactly the way I’d like to go to HELL, even though I may be going there someday! 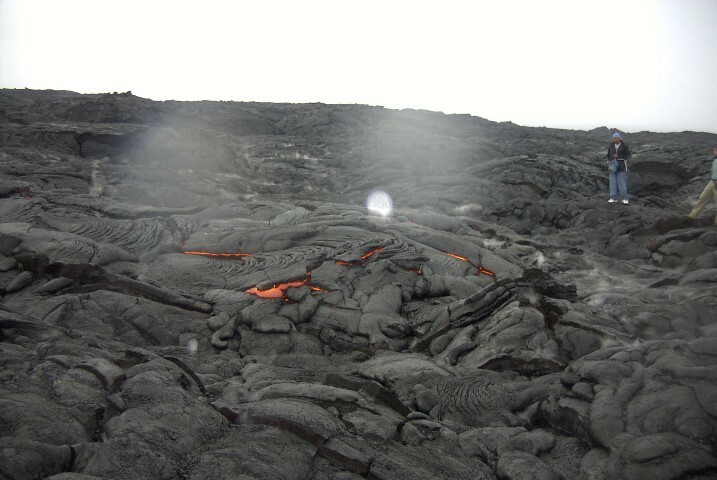 The molten lava reaches a temperature somewhere around 700 to 1,200 degrees C (1,300 to 2,200 degrees F). That’s HOT! Here is another shot. I stayed back far enough not to fall in, of course, but the heat was still almost unbearable. I was about five feet away from this. Most of the flow was beneath the surface. This shot was taken recently as I was driving on Highway 11 toward the park not far from my house. You can see how much the vog affects the visibility. So what is VOG? Here are several websites with good descriptions and excellent pictures. http://lavainfo.us/ gives us updated information on the status of vog. There is also a brochure in pdf format that excellent, giving the color codes for the vog level. I keep one handy on my desk. 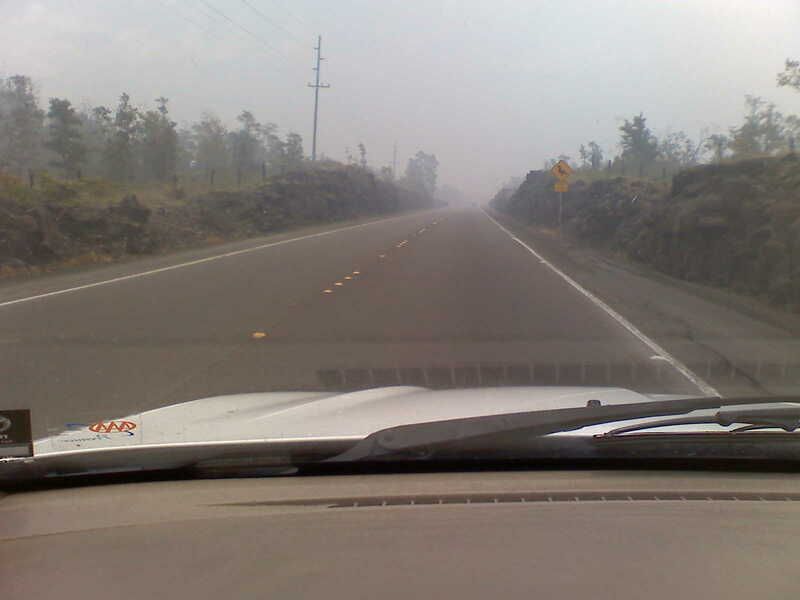 http://www.uhh.hawaii.edu/~nat_haz/volcanoes/vog.php – good one on coping with the vog, which we all need to observe. 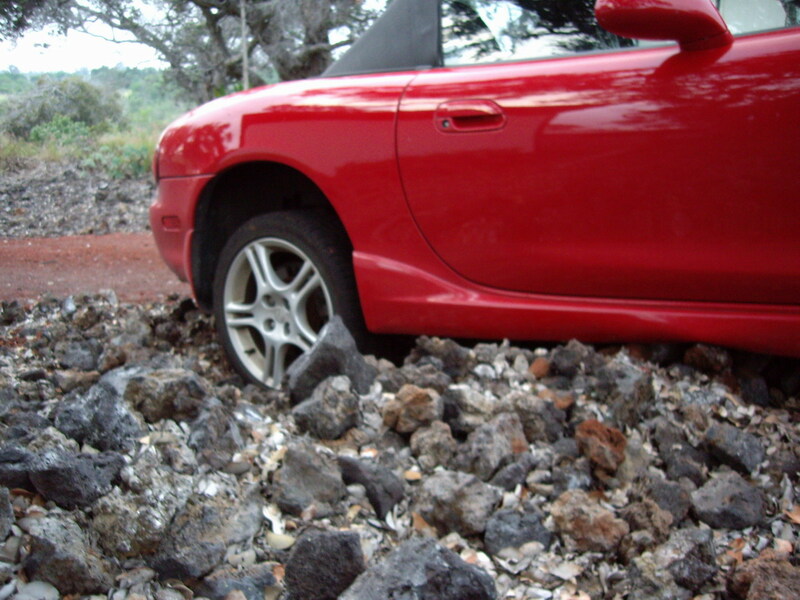 There was actually an evacuation warning given to Ocean View one day, but I was already on my way up to Kealakekua to teach for the day, so I didn’t have to do their evacuation. I apologize for giving so many websites, but these can give you much more accurate information than I can. Also, if you plan to visit this area of Hawai`i, you will need to know. As you approach the park, even before you are actually inside the park itself, you will see “steam vents” popping up all over the place. Here is a shot I took just inside the park. You can see them off in the distance. I will end this post with a couple more websites that will be of value to anyone wanting to know more. 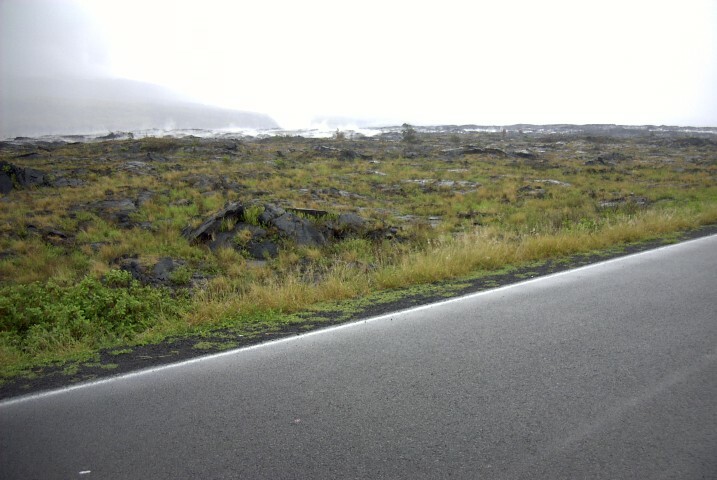 This first site shows a good picture of a’a and pahoehoe side by side. Of course, what would we do without Wikipedia? Here is a fairly complete description with great pictures of lava, both solid and molten. Madam Pele is the Hawaiian Goddess of the Volcano, and while I have a hard time working in her garden, She has also given me an exercise in patience, love, and reward. Next Next post: How Do You Dance Your Life?